Revolutionary pain and addiction therapy using neuromodulation. Transform unique neuromodulation technology into a system level product suitable for clinical applications with minimal training. 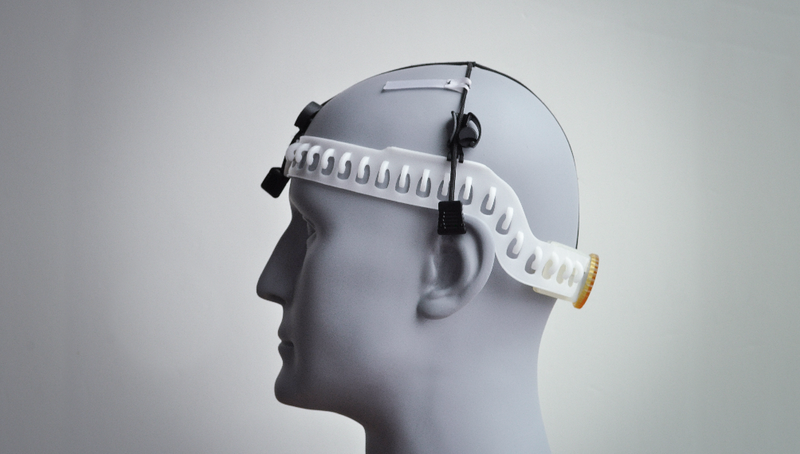 Conduct early stage user-testing of a treatment device including headband design concepts to determine the right mix of accuracy and usability. Balance accuracy of electrode placement with ease of clinical use. Provide Nuraleve with fully functional prototypes for clinical user trials. Simplify ease of use by blending electronics into compact device housing. Help expedite ISO 9001 and ISO 13485 medical device regulatory approval. Nuraleve approached Design 1st with a functional black box prototype that worked but failed to meet clinician and patient expectations. 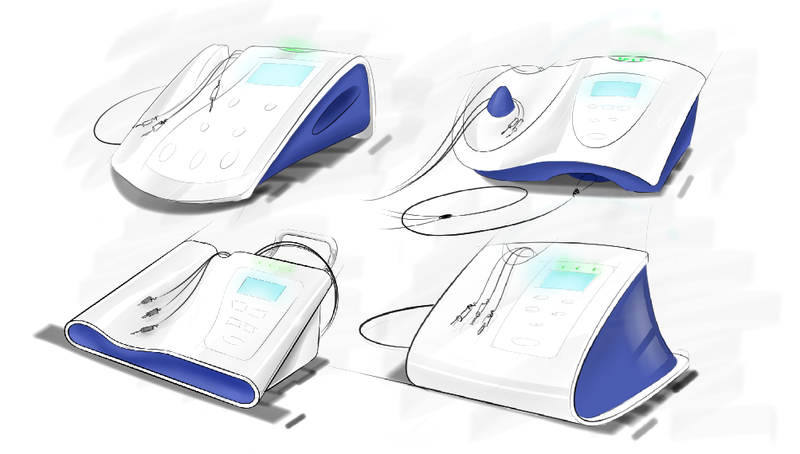 The design challenge was transforming this technology into a design that made the neuromodulation device feel safe for patients and easy-to-use for clinicians. To solve this challenge, Design 1st began interviewing clinicians from early Nuraleve trials to understand their needs and get patient feedback. This information helped support the creation of a clinician-friendly tool with an easy to adjust headband design that met user and regulatory requirements. "Make device look and feel safe for patients." 3D CAD model of human head with headband. "Fit 95% of human head sizes." Building out the design concepts of the main electronics unit in 3D CAD was straightforward, the challenge was the headband. Creating a user-friendly headband that would fit the myriad of head shapes, sizes and electro-contact locations took some creative ingenuity and human factors experience. The solution came from exploring sizing mechanisms that could easily adjust the headband with two fingers to fit 95% of human head sizes. After testing the function on multiple users and clinicians, the solution was built in 3D CAD and prototyped for testing. 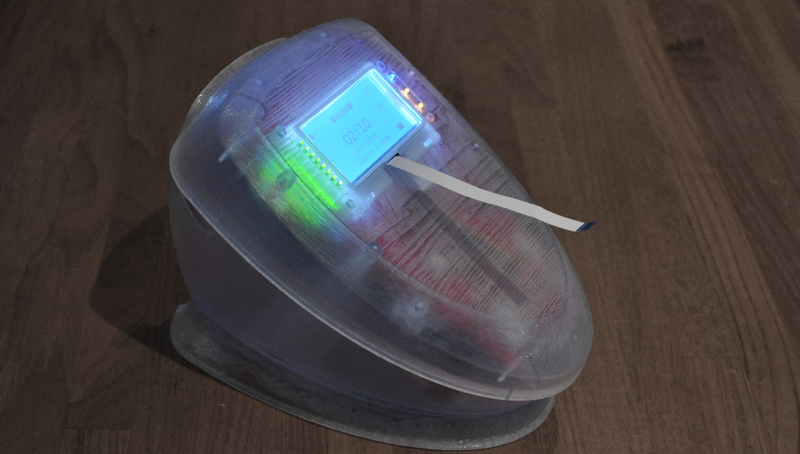 SLA model with electronics integration for clinician testing. Once the design concept was finalized for both the headband and main device, pre-production prototypes were built in the Design 1st prototyping lab. These prototypes were sent off for clinical trials to gather user feedback and compare the new design function to the original black box units. Four weeks later, Design 1st received feedback and was glad to hear the results were better than expected. 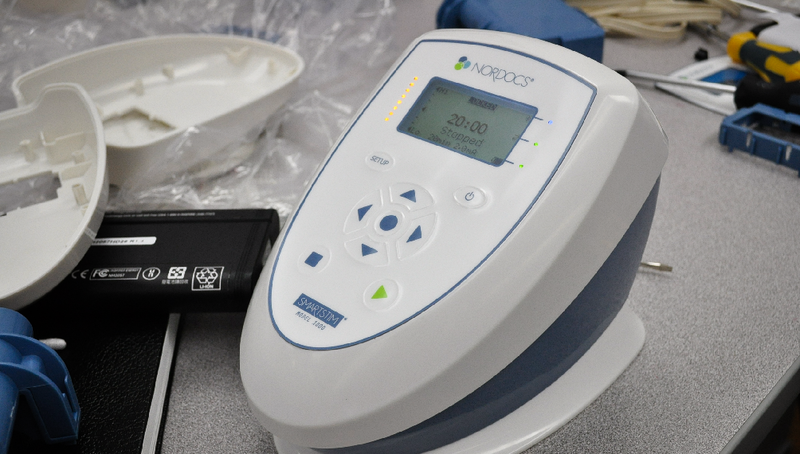 The time it took clinicians to set up and place electrodes on a new patient went from 10 minutes down to 2, making it an industry first. This time saving allows for more patients to be seen, directly impacting revenue. "Setup time went from 10 min to 2min." Pre-production unit of main neuromodulation device. "ISO 13485 and ISO 9001 certification." As a medical device, Nuraleve needs to meet strict regulatory and process guidelines on the development, assembly and manufacturing of the SmartStim neuromodulation to receive both ISO 13485 and ISO 9001 certification. Design 1st helped support Nuraleve with documentation of the development and production process. This documentation helped Nuraleve expedite their certification process and receive the internationally renowned ‘Health Canada Medical Device’ license.